This photograph has been scaled down; full resolution photograph is available here (1,800 by 1,177 pixels). Later, on 18 Aug 1945 during an aerial reconnaissance mission, this aircraft was damaged by fighters over Tokyo, Japan in what may have been the last aerial combat engagement of WWII. LAST AERIAL COMBAT OF WWII: Adding more information from Mr Stubblebine's comment. 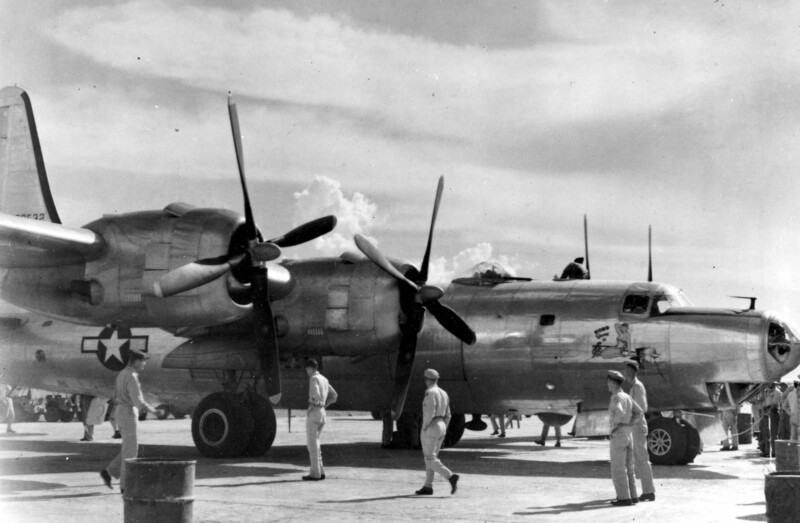 Although the war was over 18 Aug. 1945 Hobo Queen II, flown by Colonel Frank R. Cook encountered Japanese anti-aircraft fire with another B-32, were intercepted by seventeen Japanese fighters, fourteen A6M Zeros(Zekes)along with three N1K2 Shiden-Kai(George)fighters one A6M5 Model 52 Zero was flown by Saburo Sakai attacks were made, but caused no damage to the B-32s. Hobo Queen claimed two Zekes and one N1K2(George)claimed as a probable. 28 Aug. Propellers were removed from all Japanese aircraft to prevent unauthorized flights. After WWII Hobo Queen was declared surplus, and scrapped in May 1946. Col. Cooks previous aircraft was a B-29 named Hobo Queen The B-32 was armed w/10x50 Caliber machine guns with 5,450 rounds of ammo.